Is your PC running slow? Do you want it to work much faster? There is a free and easy solution called IQmango PC Cleaner. This effective tool scans your system fast, finds all the registry errors, temporary files and broken shortcuts, and 100% removes them for good. Once IQmango PC Cleaner deletes all the found useless data your computer runs twice faster than before! Download, install and run IQmango PC Cleaner right now to enjoy speedy PC performance, which you deserve! IQmango PC Cleaner lets you do a complete scanning of your system, repair all the errors detected, save the report of the current system scan and backup system before each scanning. You can also minimize IQmango PC Cleaner to system tray upon closing the program. There are three types of registry scanning available in IQmango PC Cleaner: Normal (Recommended), Advanced and Deep (Full scan mode recommended only for advanced users). Also you can choose a folder to backup deleted registry entries and select a folder to save all the log files to. 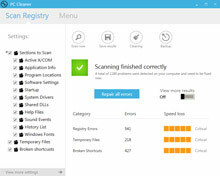 IQmango PC Cleaner also offers an option to show logs after scanning is finished. This site does not contain serial number, crack, keygen IQmango PC Cleaner serial number : serial number is the simplest type of crack. A serial number(cdkey,product key,etc) is register the program as you may already know. a crack or keygen may contain harmful software. If you cannot find the exact version you want, just give it a try. for more information read .nfo/.txt/.diz file include in zipped file.